Authentic Vietnamese street food in Enmore. When Michael Le was a child his grandmother would often serve caramelised pork belly with rice on the family dinner table. Le now offers a revised version of this dish in the form of a Vietnamese pork roll in his restaurant, Great Aunty Three. The caramelised pork roll ($6) captures the essence of what Le and wife Mai are trying to achieve: fresh, authentic, quality Vietnamese street food. The pork, slow cooked in coconut juice for up to five hours, is tender and juicy, combined with fresh vegetables in a crusty Vietnamese roll. The roast pork roll ($6) is also a winner, drenched in a honey mustard sauce, crisp bits of crackling and copious amounts of carrot, cucumber and coriander. Watch this space for the up and coming chicken roll. Rice paper rolls, although common in Sydney, can be a hard art to master. Great Aunty Three does not disappoint, with a delicious duck roll, a prawn roll that is paired well with a rich sweet chilli and peanut sauce and a surprisingly tasty and hearty vegan roll (all $2.80 each or three for $6.80). 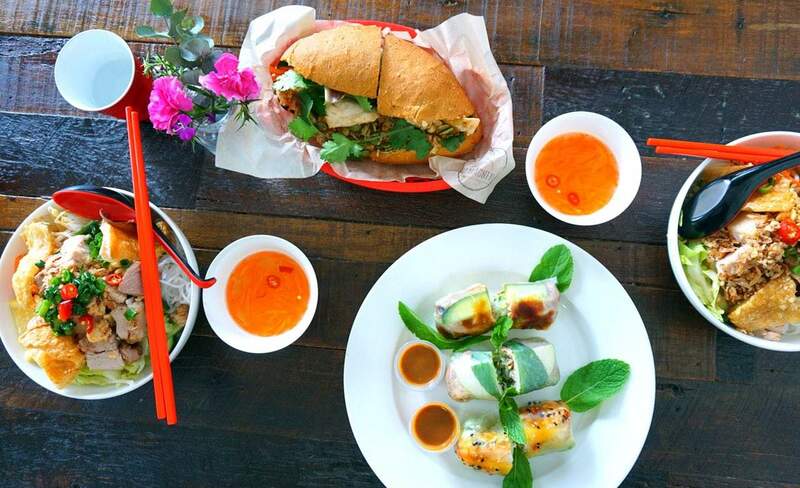 To go with your rolls, try a Vietnamese tea or a refreshing fruit shake. Michael, Mai and their staff are warm and welcoming. The red decor is at once striking. Patrons can sit at small tables and stools outside on the footpath or benches and a soon to be communal dining table inside. Stopping in for a roll on the go is becoming a thing, too. Inspired by family, and authentic Vietnamese street food passed down from generation to generation, Great Aunty Three makes you feel instantly at home.